Tonight I am going to a secret session, which is exactly what it sounds like: an invitation-only house party at a clandestine location, where attendees are free to consume joints, dabs, and edibles in a safe, comfortable space. While I’m still thinking through the specifics of my outfit, thanks to the clever folks at Kizzle Kit, I’ve got my other accessories under control. 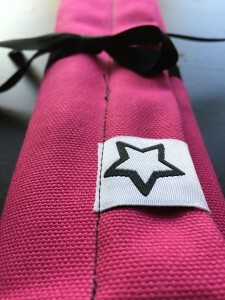 Everything I need to feel prepared, except for the actual cannabis, is contained within a pink canvas case, which folds to be just smaller than my wallet and fits easily into my purse. This is my Kizzmit – made from sturdy but flexible duck canvas, secured by magnets, and embellished with a satin ribbon – and it goes everywhere with me these days. If we forget to bring it along, we inevitably regret it. Why?, you wonder. What is so magical about that piece of cloth? Because the Kizzmit is a comfy home for Kizzmos, and Kizzmos are the cannabis accoutrement you need that you didn’t know you needed. Better put, they’re the accoutrement you knew you needed but forgot to invent. Lucky for us, Amy Peters remembered. 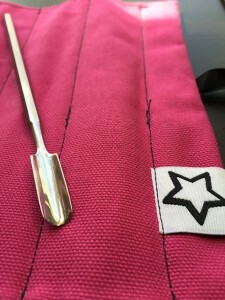 The founder and owner of Kizzle Kit is also its product designer, inspired to perfect these high-quality, stainless steel tools that clear, poke, jam, dab, clean, and scoop. 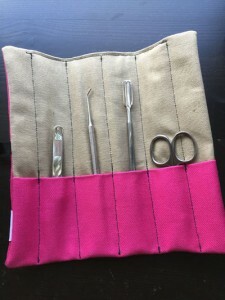 The Pokie, Jammie, Snippie, and Weezie are beautifully crafted, fun to look at, and nice to hold. They fit snuggly into the Kizzmit, held in place by cloth and magnets, and they’re easy to keep clean. 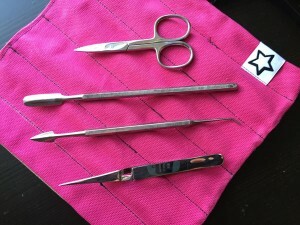 Though they may initially remind you of dab tools or a manicure kit, closer inspection reveals their simplicity and distinct functionality. She’s right. Each Kizzmo has unique features that make it a go-to tool for a particular occasion. 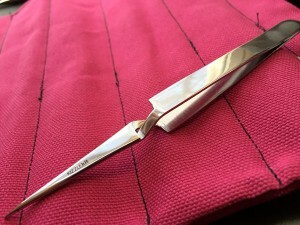 The Weezie, for example, looks like a pair of tweezers but is held closed by reverse tension; it opens when you squeeze it so you don’t have to think about holding it closed. 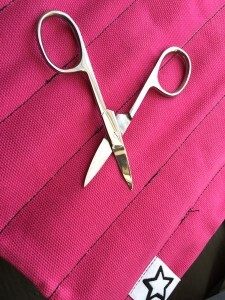 The blades of the Snippie scissors are long, thin, and strong for trimming flower inside a stash jar and cutting through thick stems. The most original Kizzmo, the one that required the most meticulous measurements of smoking and vaping apparatuses, is the Jammie. It’s also the one we use the most. Peters refers to the Pokie as the where-have-you-been-all-my-life? tool, and we couldn’t agree more. “Why did I have to search the entire apartment just to clear my bowl?” she laments. Now we don’t. You unbend paperclips to unclog the tiny hole at the bottom your bowl; consequently there are no paperclips to be found in your home office. 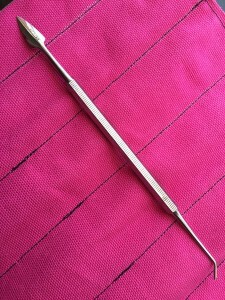 You use the same tweezers to pluck your eyebrows as you do to clip your joints; consequently, when you’re really stoned, you frequently drop your joints because you forget to squeeze the tweezers hard enough. You constantly have sticky fingers from pinching ground up cannabis to push into your vape; despite said stickiness, you drop a good portion of each pinch trying to load it in tightly enough. Your concentrates bear the distinct mark of your fingerprints from the transfer of product from its wax paper dispensing receptacle to its silicon home; not only incriminating in many places but certainly increases the risk of contamination. You borrow tiny scissors from your daughter’s art supplies to snip the ends of off joints or to trim extra leaves from your cannabis. 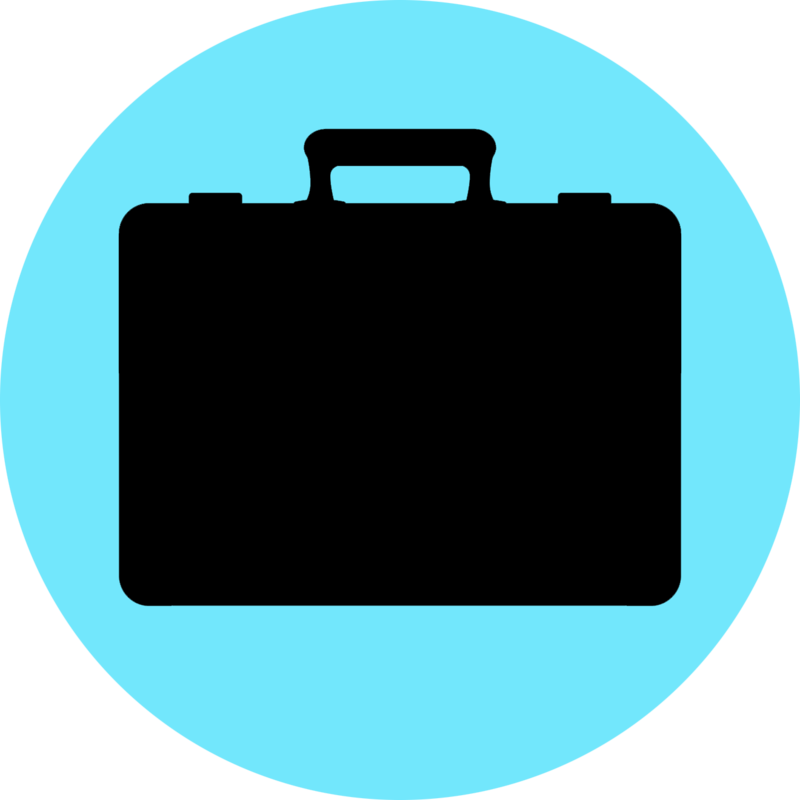 Even if you don’t relate to any of the above, or if you’re a person who prefers using office supplies and toiletry items to prepare for your sessions (in which case, we probably shouldn’t hang out), Kizzle Kit is a company worth watching. First, they’re women-led and family-owned, two characteristics that always score points with Weekend Review Kit. Amy Peters is supported by a staff of partners that includes her husband, sister, brother, and a cousin. The family doesn’t stop there: besides her roles at Kizzle Kit and her full time job, Amy is mom to a four-year-old son. She also has big aspirations. In addition a line of new accouterments in development, Peters is working to produce her original vision, the actual Kizzle Kit – a secure, customizable, interlocking organizational system discreetly storing cannabis and accessories – which will be available for purchase soon. She is eager to unveil her Caboodle-inspired creation to world. We like the way you do things too, Amy, and we hope Kizzle Kit is around for a long time. Want a Kizzmit and Kizzmos of your own? Order now at KizzleKit.com and use coupon code WomenLead2016 to get 20% off! Posted in Accoutrements, Reviews, The Cannaseuse and tagged Amy Peters, cannabis accessories, cannabis accoutrements, dabbing accessories, Jammie, Kizzle Kit, Kizzmit, Kizzmos, Pokie, smoking accessories, Snippie, Weezie.